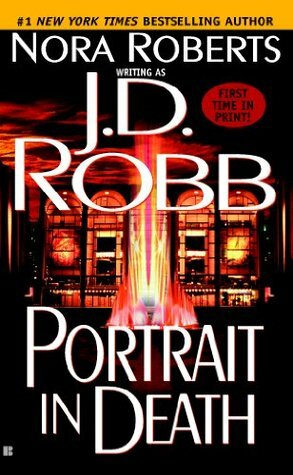 Portrait in Death is #16 in the In Death series by J. D. Robb. As usual for this series I found it very good. I loved the continued play between Eve and Summerset. Eve is feeling great because she is going to have a little peace because Summerset is going on holiday. Well he was until he has a set back. As much as they like to stir each other up, they show their united front when it comes to caring for Roarke. Plus Eve also shows she has an understanding side when it comes to Summerset. A large portion of this book is about Roarke. He receives some information from someone he meets at the health centre he contributes to. This woman gives him some information that totally skittles him and also leads to a skirmish with Eve. After this skirmish its good to see how Eve goes about learning what a wife might/should do in her situation. I admit to reaching for the tissues when Roarke visits Ireland. If you've read the book I think you'll know, if not I won't spoil it. Oh, of course there are murders that Eve and her team are tracking down, as usual creepy and very strange. It takes them awhile to solve and they almost lose one of their team in the process and some get a little weepy over that. All I can say is thank goodness - because I expect to see heaps of development for this character as I read on in the series. Long live Eve, Roarke, Peabody, McNabb, Somerset and so many more! I am glad that you are enjoying this series. Hoping to start to read this series sometime this year!! Usually crime and mystery and suspense are not my thing, but this series is so good and I love all the relationship angles in them.